John Ryerson used to joke that since the team he loved that didn’t really exist had never taken to the field, they were in his mind forever undefeated. 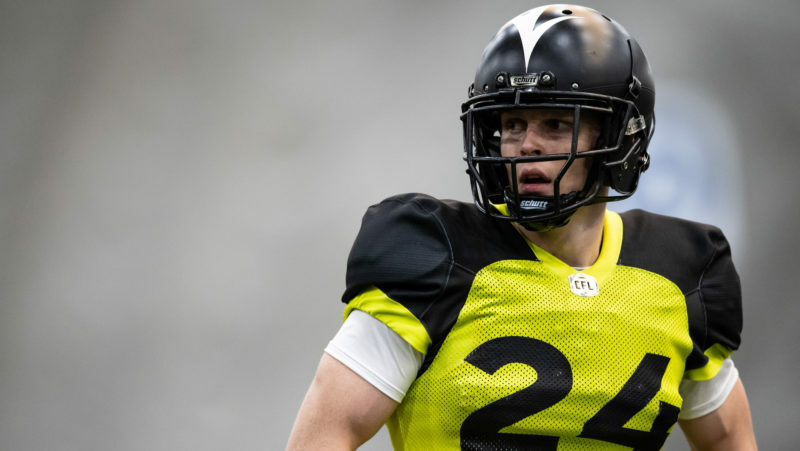 “Maybe we want to stay that way,” he said at the Grey Cup in Toronto in 2016. 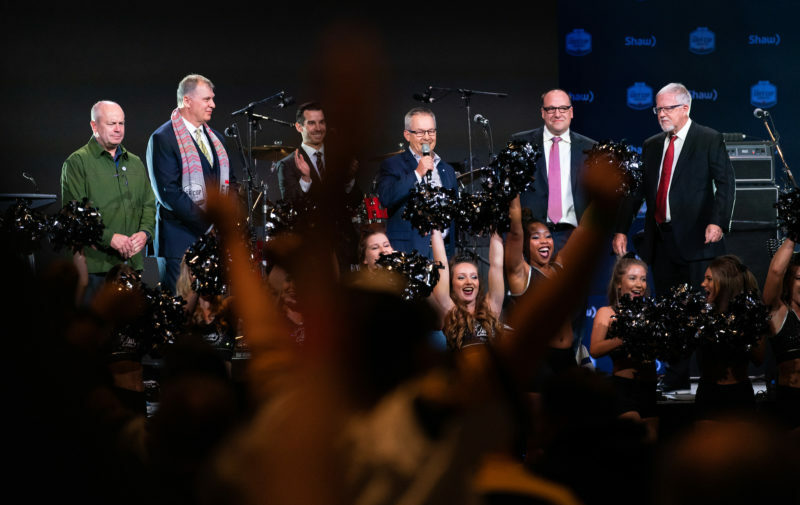 On Friday night in Edmonton, hosting his 11th Atlantic Schooners Kitchen Party, his 26th year of celebrating the Schooners and participating in his 27th Grey Cup, the Nova Scotian watched the annual event that he created take a step closer to becoming a reality. Maritime Football Ltd. let Ryerson, the pied piper of what’s often the biggest and best party of Grey Cup week, unveil the name that fans had voted on over the last few weeks. 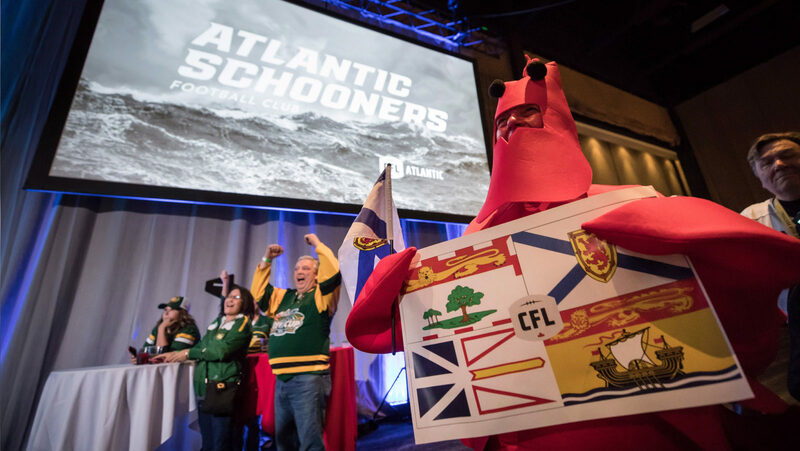 The proposed 10th team in the CFL will be named the Atlantic Schooners. “I can’t even tell you how I feel. I honestly don’t know,” Ryerson said, taking a break from running a hectic, extra celebratory party. “To be asked to unveil the name itself, I didn’t know that. My heart just dropped. I’m just full of emotion right now. Wow! For the last nine years, that’s what it’s been: an understaffed, frequently over-attended party hosted by a fan that dug up a relic of CFL history and ran with it. It was fun to add a maritime flavour to Grey Cup week and in a league full of quirks, the Schooners party fit like the 12th man on the field. For years, Ryerson has sold Schooners jerseys and t-shirts to try to help cover his costs. When he made a profit, it went to a food bank in whatever city was hosting the Grey Cup that year. He says he’s donated $40,000 to $45,000 to cities over the years. “If we don’t make a profit it goes to me,” he laughed. Then last year, Maritime Football Ltd made clear its intentions to bring the CFL to Halifax. The feeling at the party this year was electric. The room was packed with every colour of jersey in the league, alongside Ryerson’s mesh, navy blue Schooners jerseys. There were t-shirts on sale with a picture of a harbourfront and a lighthouse, with Field of Dreams’ tagline — If you build it, they will come — splashed across the horizon, noting the stadium construction that remains the key obstacle in that 10th franchise being granted. The room was full of people, full of colour and full of hope. 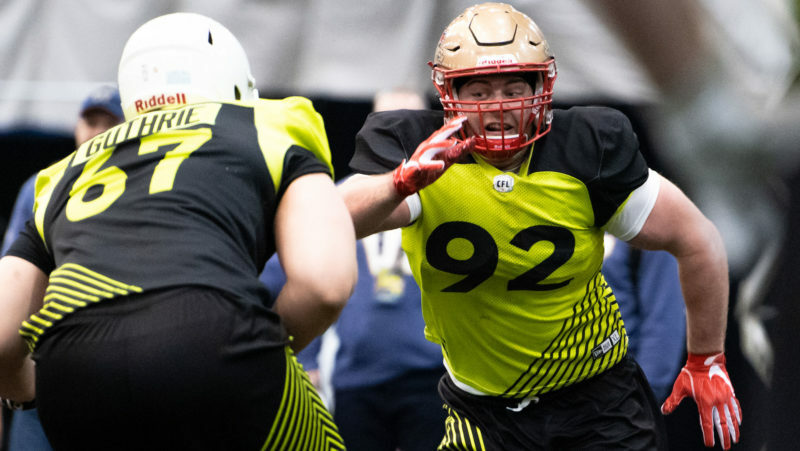 Commissioner Randy Ambrosie took the stage and dreamed openly of a Labour Day that was full of regional matchups, capping it with the idea of The Coast Bowl. The BC Lions facing the Atlantic Schooners. “It’s really emotional. I’ve been to every (party) that they’ve had,” said Roger Hodges, a Riders fan from Saskatchewan that lives in Calgary. He wore a Schooners jersey on Friday, but out of allegiance to his team, wore his green Riders hat. “The idea that finally, we’ll have a league that’s coast-to-coast was something that I was on board with right off the bat. It made complete sense. As he ran around the giant room at the Shaw Conference Centre, introducing different dance teams and handling other hosting duties, Ryerson was clearly overwhelmed. In the five minutes we spoke, he was interrupted three times by party goers that wanted to shake his hand and congratulate him. He never meant for it to happen, but he became the faint heartbeat of a forgotten franchise. His fun party with a half-joking hope of one day becoming something more felt like it did just that, at least for one night. When he was up on the stage with the hopeful owners of the 10th team in the league, he made sure the video feed was running. His two sons watched from far away, one living in New Jersey, the other in Costa Rica. Like Maritime Ltd.’s Anthony LeBlanc, Ryerson speaks in football metaphors for the franchise bid’s progress. It’s a long, careful, well-crafted drive up the field. They’re in the red zone, on the verge of one of the biggest touchdowns in the CFL in the last 35 years. “I think the thing that I’m going to remember the most tonight was the opportunity that I was given to unveil the name as a real name, versus a fictitious name,” Ryerson said.